After a few very busy weeks, a nasty cold and general chaos I started back at the gym yesterday. I actually enjoyed it and today I backed it up with a quick warm up session with Pete and a lap around the Bay Run with a combination of walking and jogging. Let's just say I am more than happy to be sitting down right now, my legs feel like jelly! Aspall is this weeks apple cider, and it is produced by the Chevallier Family in Aspall, Suffolk - England. For eight generations the Chevallier Family have been churning out quality cider and this particular blend was created in 2003 to celebrate their 275th year of cyder making. First thing you notice about this one is it's crystal clear bright yellow hue. It's gorgeous, particularly on a sunny day like today. With fine carbonation and a welcomed balanced sweetness, this one is is surprisingly good. I remember many of the traditional ciders in London to be cloudy, flat and served warm and in stark contrast, this one is crisp, light and delicious. Fresh ripe apple flavours are evident from the outset, with a nice acidic balance and just a hint of dryness toward the end. 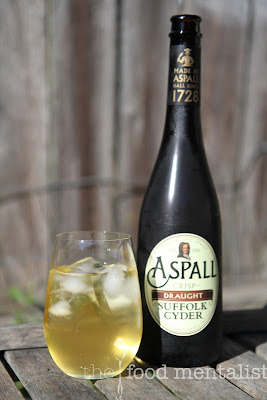 Despite it's 5.5% alcohol, it doesn't exhibit strong alcoholic flavours like some other ciders do. Overall, this one is very easy to drink. It will pair well with light fresh flavours - like stir fries, noodle dishes or a generous cheese platter laden with dried fruit and fresh figs. At 5.5% alcohol, a 500ml bottle will provide you with 2.2 standard drinks. 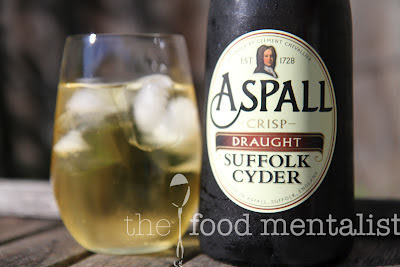 The Food Mentalist purchased Aspall Crisp Draught Suffolk Cyder at Camperdown Cellars. Its is also available at Dan Murphy's and other liquor retailers. RRP $ 6.90 per 500ml bottle. Tell me, how often do you exercise? Do you find it hard to fit it in?